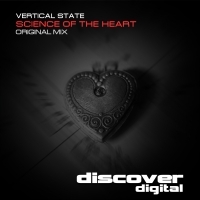 Vertical State delivers his next tune for Discover with the blissfully melodic Science of the Heart. In true Discover style the bottom end and percussion suitably driving giving the tune pace from the start. The breakdown is an item of beauty with a lush piano topline moving into epic chords that smash the track into orbit when it kicks back in from the breakdown. Proper trance, produced with style by Vertical State - just how we like it!!! 'Science of the Heart' is available now from Beatport and iTunes.